This great book clearly, gently, and accurately describes the difficulties experienced by our spiritual and physical ancestors as they endured hostile prisons, risked the tumultuous sea, settled in an untamed land, and met with unknown natives-- all for the chance to worship God in a way that they believed was right. Recommended for ages 6 and up, Stories of the Pilgrims begins with Queen Anne’s visit to Scrooby Inn and tells of the everyday life of the Pilgrims. 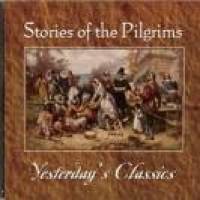 The Brewster children and other Pilgrim boys and girls are the center of interest. This would be a wonderful story for your family to listen to in the days before Thanksgiving. This book is also available in paperback book format. These will play just fine on your computer CD drive, laptop, DVD player, XBox, PS2, or MP3 compatible CD players (available at most large electronics or discount stores). They will not play on a standard CD player.